Just another solid result for Tial Sport's 68mm VTG turbocharger upgrade on the 991 Turbo 3.8 platform. 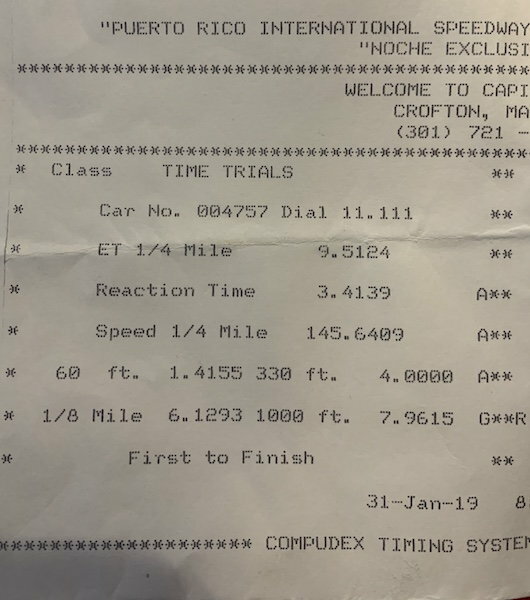 This is a 2015 Turbo S from Puerto Rico and the 1/4 mile timeslip is backed up with GPS timed results as well. This is the sweet spot in 991 Turbo modding as to go beyond this level will require a built motor and ditching the VTG turbochargers. Not to mention fuel system upgrades. Excellent, solid, reliable, and repeatable results. These cars are just ridiculous, I need this in my life. Incredible. And I wish Draggy would show 60-130 on quarter mile times where the trap exceeds 130. I agree, that would be a good data point to include in that same page. It is really amazing because its not just a dedicated drag machine, its fully capable to cut it up on a track, or take the kids to school as well, that's a lot more capable than a lot of other 9.5 sec cars out there.